Engineering As defined by Wikipedia, ‘Engineering is the discipline, art and profession of acquiring and applying scientific, mathematical, economic, social, and practical knowledge to design and build structures, machines, devices, systems, materials and processes that safely realize solutions to the needs of society’. Definition defines engineering perfectly that’s beauty of Wikipedia! So engineering is about the application of skills of individual or the persons associated with the work. As engineering students it is your duty to acquire these values during the four years course and impart these engineering skills in yourself. The skills and expected transitions associated with it are discussed in the next part of this article. Someone might tell you that such skills are inborn or something like, that but let me promise you it’s a C.R.A.P. and just ignore any such advice. Every person has some skills and you also have some. its just that you might not be aware of it and in this course of engineering you are supposed to discover them. all you need is a good teacher. It’s a good teacher who helps the students to direct these verities of skills into the skills required for engineering. (just like a converter!). So it’s a matter of good teacher and it’s your duty to look for such good teacher and follow guidelines issued by him. All you have to believe in your teacher n yourself with a scientific temper. Scientific temper as defined by Wikipedia, ‘Scientific temper describes an attitude which involves the application of logic and the avoidance of bias and rigid ideas’. While working with scientific temper you should be always open to the new ideas even if it threatens your current believed system. Discussion, argument and analysis are vital parts of scientific temper. Elements of fairness, equality and democracy are built into it. This temper gets developed as per your anxiety. This is inherent part of engineering and technology. Let me give you small example as how scientific temper may work, all of you use mobile phones and send 100s of SMS daily but have you ever wonder why SMS is limited by 160 characters only? 160 is not in power of 2 (2^(any whole number) != 160)which means it’s not data compression size which limits the SMS size! Then what it might be? Thinking in such way for our daily activity is what the scientific temper all about. There are more values which reflects the true spirit of engineering but for that aid of technology is needed so I have discussed it separately in last part of this article. As a professional engineer or engineering student you should always remember that, true essence of engineering lies in your daily behavior, it lies in how we treat the people, how you handle the situation. This is what makes the difference between other fields people and engineers. ‘Creating plan with cool mind and executing it with full zest is what defines the true engineering spirit’. the engineering advantage really works and you gotta feel the power of knowledge, it’s amazing. Technology as defined by Wikipedia, ‘Technology is the usage and knowledge of tools, techniques, crafts, systems or methods of organization’. In plain English It is an application of science to solve problems. Technology comes from necessity. You have a problem to solve, so you invent the solution. You must use technology or innovate new technology to solve the problem. Since the invention of wheel, probably the first machine technology has changed life of human radically, and engineers have evolved the technology based on their innovations. Most technology is to defer labor, reduce human efforts and to make life of human simpler. Therefore while thinking of technology your approach should be in this way only: to make life simple. Technology is often a consequence of science and engineering. Although engineering and technology overlap most of the times, there is very subtle difference between technology and engineering which is discussed in next section. The true essence of technology lies in its complexity, risks and never giving up attitude. Complexity and risks are inherent in the technology. The complexity and risk have something more integrated with it and I have discussed it separately in the article ‘calculated risk of opportunity’ :- the basic strategy to work with technology successfully. Rather than staying away from the complexity and risks and being dependent on somebody else to do these jobs, one should go for it with proper planning. Your never giving up attitude and patience helps you greatly in all these activity. 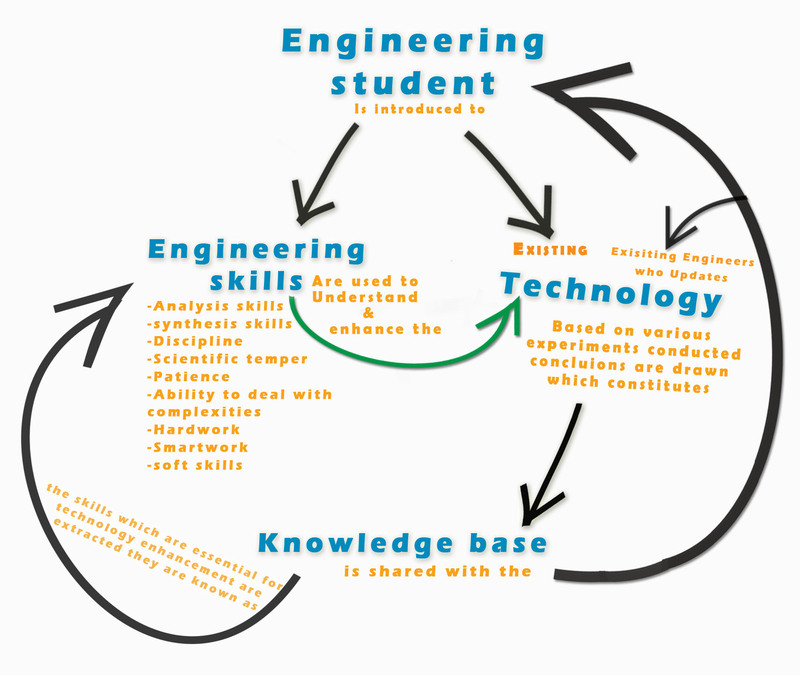 Engineering science and technology are interrelated and interdependent phenomenon and complies each other. So let us discuss them together to get most of from it. Technology always helps or results in productivity and marketing while engineering is all about the skills required to achieve it. In the language of IT, engineering is more of software aspect while technology is the hardware aspect. Engineering is about the ethics and skills while working or solving a problem and technology is application of science with help of engineering skills for innovations. So science technology and engineering are actually inseparable things and one should pursue them as a single entity. How to do it? well read all further part of this article. Confused? Don’t be, As I said you earlier complexity is inherent part of technology! So just give away this illusion of control that technology is difficult or complex and believe me after some time you will find these things simple and in fact you will also learn to talk and write with such complexity. How to break this illusion of control is discussed in the article, ‘calculated risk of opportunity‘. You find this confusing since you are not familiar with it. you haven’t read enough technical stuff, infact it largely depends on your habits, I don’t know how often you read something knowledgeable not fiction. So reading is most essential part of learning, you don’t have to be reading like arts students, 1000s pages book… no not at all, technology is not that difficult either, unlike history or politics students where each concept largely differs from other and not necessarily happen for a good reason, in tech world things are always related and happen for a certain reason to make things better. So if you study something about mobile OS then you can always relate this with computer OS, if you study layered architecture in networking then yes you can always relate it with all other layered architecture. All you need to push up your anxiety and greed to next level for search of knowledge and will to know things: how stuff works. In next article 12 transitions from academic to corporate life i have discussed the skills required for engineering and after that , i have discussed about the risk and complexity of technology in the article, calculated risk of opportunity. you can read either of article first. the articles are framed based on the diagram shown on this post, however going with the sequence is always recommended. Definition defines engineering perfectly that’s beauty of Wikipedia! So engineering is about the application of skills of individual or the persons associated with the work. As engineering students it is your duty to acquire these values during the four years course and impart these engineering skills in yourself. The skills and expected transitions associated with it are discussed in the next part of this article. Someone might tell you that such skills are inborn or something like, that but let me promise you it’s a C.R.A.P. and just ignore any such advice. Every person has some skills, you are also having that. It’s a good teacher who helps the students to direct these verities of skills possessed by individual into the skills required for engineering. You know just a converter. So it’s a matter of good teacher and it’s your duty to look for such good teacher and follow guidelines issued by him. All you have to believe in your teacher n yourself with a scientific temper. Scientific temper as defined by Wikipedia,< ‘Scientific temper describes an attitude which involves the application of logic and the avoidance of bias and rigid ideas’. While working with scientific temper you should be always open to the new ideas even if it threatens your current believed system. Discussion, argument and analysis are vital parts of scientific temper. Elements of fairness, equality and democracy are built into it. This temper gets developed as per your anxiety. This is inherent part of engineering and technology. Let me give you small example of scientific temper, all of you use mobile phones and send 100s of SMS daily but have you ever wonder why SMS is limited by 160 characters only? 160 is not in power of 2 which means it’s not data compression size which limits the SMS size! Then what it might be? Thinking in such way for our daily activity is what the scientific temper all about. As a professional engineer or engineering student you should always remember that, true essence of engineering lies in your daily behavior, it lies in how we treat the people, how you handle the situation. This is what makes the difference between other fields people and engineers. ‘Creating plan with and executing it with full zest is what defines the true engineering spirit’. the engineering advantage really works and you gotta feel the power of knowledge, it’s amazing. Technology as defined by Wikipedia, ‘Technology is the usage and knowledge of tools, techniques, crafts, systems or methods of organization’. In plain English It is an application of science to solve problems. Technology comes from necessity. You have a problem to solve so you invent the solution. You must use technology or innovation to solve it. So trial and error until you succeeds. Most technology is to defer labor, reduce human efforts and to make life of human simpler. The true essence of technology lies in its complexity, risks and never giving up attitude. Complexity and risks are inherent in the technology. The complexity and risk have something more integrated with it and I have discussed it separately in ………… basic strategy to tackle technology successfully. Rather than staying away from the complexity and risks and being dependant on somebody else to do these jobs, one should go for it with proper planning. Your never giving up attitude and patience helps you greatly in all these activity. Technology always helps or results in productivity and marketing while engineering is all about the skills required to achieve it. In the language of IT, engineering is more of software aspect while technology is the hardware aspect. Engineering is about the ethics and skills while working or solving a problem and technology is application of science with help of engineering skills for innovations. So science technology and engineering are actually inseparable things and one should pursue them as a single entity. How to so it? well read all further part of this article. Confused? Don’t be, As I said you earlier complexity is inherent part of technology! So just give away this illusion of control that technology is difficult or complex and believe me after some time you will find these things simple and infact you will also learn to talk and write with such complexity. How to break this illusion of control is discussed in the article, ……………..
You find this confusing since you are not familiar with it. you haven’t read enough technical stuff, infact it largely depends on your habits, I don’t know how often you read something knowledgeable not fiction. So reading is most essential part of learning, you don’t have to be reading like arts students, 1000s pages book… no not at all, technology is not that difficult either, unlike history or politics students where each concept largely differs from other and not necessarily happen for a good reason, in tech world things are always related and happen for a certain reason to make things better. So if you study something about mobile OS then ye you can always relate this with computer OS, if you study layered architecture in networking then yes you can always relate it with all other layered architecture.